VFL: Round 8 in 60 seconds Get a snapshot of Collingwood's clash with the Casey Scorpions in 60 seconds with Collingwood Media. 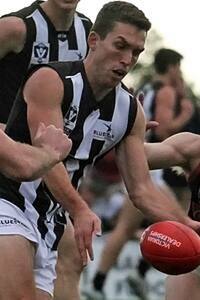 Clinton Young played three quarters in Collingwood's four-point loss to the Casey Scorpions. Photo: Shane Barrie. Injuries, rotations and a strong breeze have all played a factor in Collingwood’s four-point VFL loss at the hands of Casey at Casey Fields on Saturday. The Magpies were bolstered by the return of Darcy Moore and once again featured the recovering Ben Reid and Clinton Young as they looked for their fifth consecutive win. However a handball-happy Casey proved too strong as they overcame an eleven-point three quarter time deficit to kick three goals to Collingwood’s one in the final term. “Any game you get beaten you’re always pretty disappointed. But at the same time I’m pretty proud of the effort. I thought our guys committed really strongly all day,” Collingwood VFL coach Dale Tapping told collingwoodfc.com.au post game. The game started on a positive note for the travelling Magpies as they looked to continue their five-game winning streak. After captain Jack Hellier broke through a banner recognising his 50th VFL game, Reid was quick to find form in arguably his best quarter of the season. “I think I ran over the ground pretty well and used the ball pretty well,” Reid told collingwoodfc.com.au post match. The management of key players proved a contributor to the shape of Collingwood’s side throughout the day. Moore and Young also played just three quarters, with both sitting out the first term before having a significant influence in the second half. Brayden Maynard only played the second half as an AFL emergency, while Sam Dwyer’s minutes were also restricted. Corey Gault ensured Collingwood got off to a fast start, taking several contested marks and kicking two first quarter goals. Collingwood first quarter advantage was quickly nullified in the second term as Casey kicked with the wind and took a two-point lead into half time. 14 of the matches 19 goals were scored at the northern end of the ground as conditions continued to play a role in the match’s proceedings in the second half. With an eleven point lead, Tapping says the wind was something that was discussed at three quarter time. “We had to deny them of any forward momentum going forward from the stoppage. I thought we did that reasonably well,” he said. Tapping also commented on injuries to two of Collingwood’s most influential VFL listed players, Jeremy Taylor and Michael Still. Taylor left the game in the first quarter with a suspected knee injury, while Still was assisted off by trainers after hurting his hamstring in the final term. “Taylor… I don’t think it’s the worst of the knees, but still enough to set him back. It’s disappointing for him because he’s been really good for us since coming across from the Gold Coast,” Tapping said. While the attention of the Magpie Army now turns to Collingwood’s Queens Birthday clash with Melbourne, the VFL Magpies will contend with an eight-day break before they return to Victoria Park next Sunday. The clash with Werribee will begin at 11am before Collingwood play the GWS Giants at the MCG.